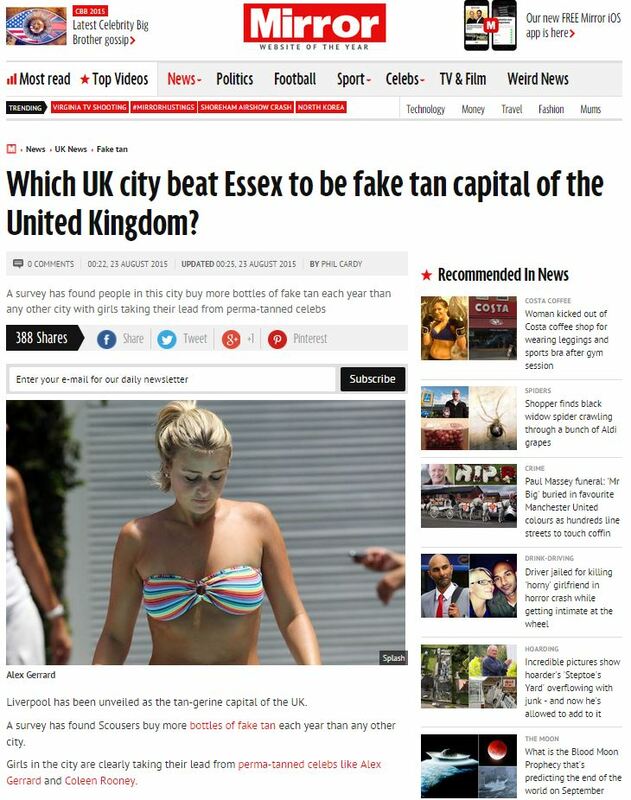 Which UK city beat Essex to be fake tan capital of the United Kingdom? Liverpool has been unveiled as the tan-gerine capital of the UK. A survey has found Scousers buy more bottles of fake tan each year than any other city. 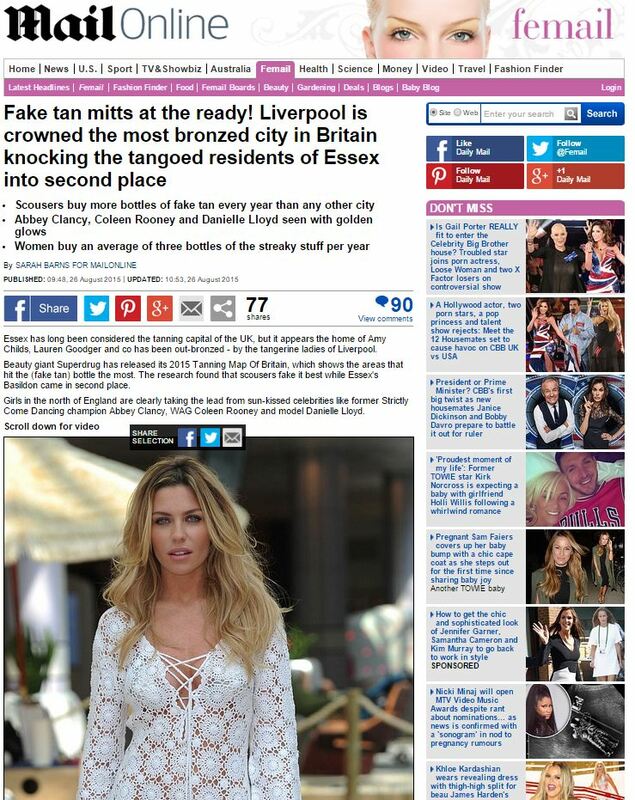 Essex has long been considered the tanning capital of the UK, but it appears the home of Amy Childs, Lauren Goodger and co has been out-bronzed – by the tangerine ladies of Liverpool. Beauty giant Superdrug has released its 2015 Tanning Map Of Britain, which shows the areas that hit the (fake tan) bottle the most. The research found that scousers fake it best while Essex’s Basildon came in second place. Girls in the north of England are clearly taking the lead from sun-kissed celebrities like former Strictly Come Dancing champion Abbey Clancy, WAG Coleen Rooney and model Danielle Lloyd. The survey found Superdrug stores sell one million bottles of fake tan in the UK each year with 25-34 year olds spending the most on it. Megan Potter, Head of Beauty at Superdrug said, “It’s fascinating to see a dramatic difference in sales across various cities in the UK. “Liverpool ladies are renowned for their glam style and always look red carpet ready wherever they go. Interestingly, if not predictably, this glorified advert made quite a splash in the local papers – not just in Liverpool as it was crowned top of the pile, but also in third-placed Manchester and fourth-placed Birmingham, too. Which just goes to show that while fake tans might be popular, fake news stories are even more so. This entry was posted in Superdrug and tagged Birmingham Mail, daily mail, Liverpool Echo, Manchester Evening News, Megan Potter, mirror, Phil Cardy, Sarah Barns, superdrug on September 9, 2015 by Michael Marshall.